Gosh, it's been an embarrassingly long time since I've posted here. 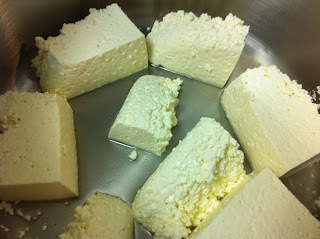 I've been quite busy over at Eating Rules, and I'm thrilled to be back in the kitchen making cheese once again. A few months ago, my favorite pickler bought me a Hanna Waterproof pH Tester for my birthday, and today we're finally giving it a whirl. This thing is awesome. 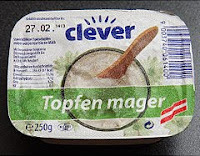 Dip it in the milk or whey, and about 10 seconds later, Blammo! you've got a pH reading! (okay, there isn't actually any explosion, unless you yell "Blammo!" yourself, which I highly recommend). 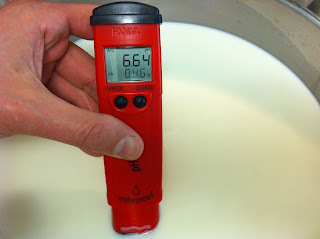 It's as easy as using a thermometer (and actually includes a thermometer, since pH readings done in this manner must be temperature-calibrated). Of course, without knowing exactly what pH we're supposed to hit and when, this cool little device won't actually be much help. None of my recipe books reference pH numbers -- just times and temperatures. I've been sifting through my copy of Paul Kindstedt's American Farmstead Cheese, which is by far the most technical book in my library. 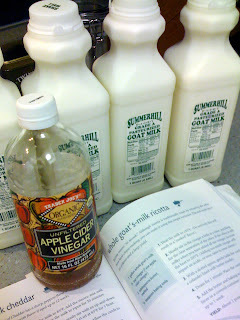 He discusses pH in depth -- but since the book doesn't include any specific recipes, that only helps so much. I did find a table on page 155 where he indicates "optimum" pH -- with some timing -- for making Cheddar. 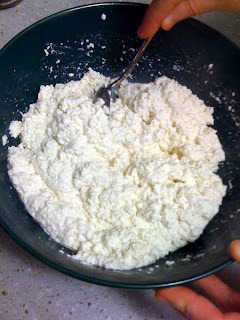 Already it's been a bit of a help: Heating the curds (bringing them up from 86°F to 100°F) went slower than I would have liked, but keeping an eye on the pH still let me know we were making progress. As the pH slowly worked its way down, I decided to drain the curds at 6.15 -- based on Kindstedt's table. This took more than an hour longer than Ricki's recipe, but less time than indicated in the table. 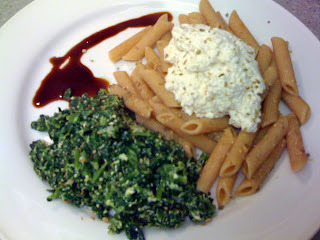 As I write this, the curds are cheddaring comfortably in the pot. After only 15 minutes, on the first flip, the pH was down to 5.80. 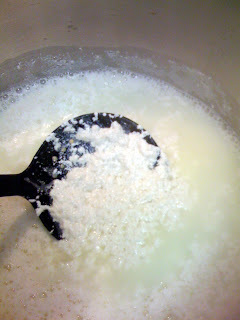 If all goes according to plan, at the end of the requisite two hours we'll be at exactly 5.35, and then we'll mill the curds (translation: break them into small cubes), and proceed with the next steps. If we hit 5.35 a little early, I might actually decide to stop cooking and mill them sooner than Ricki calls for. I'm excited to start using the pH tester every time -- building my own reference library -- and hopefully with a bit of diligence I'll be able to solve my texture problems once and for all. Do you have any experience pH readings? Please post in the comments with any questions and/or advice! My friends Sean and Michelle showed up to my holiday party with the perfect gift: Three wonderful cheeses they discovered at Venissimo Cheese, their neighborhood shop in San Diego. First up: On the far left is the Humboldt Fog, an increasingly-popular goat's milk surface-ripened cheese from Cypress Grove. The vein of edible ash is the signature mark of this rich, creamy, and delicious monster. 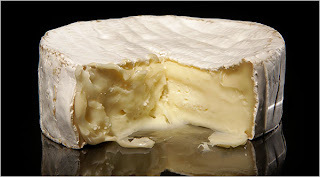 (I'm a big fan of Cypress Grove's cheeses -- especially the Fog and the Truffle Tremor, one of the most spectacularly decadent and knee-buckling cheeses I've encountered.) Venissimo's notes: California's top seller, with a ribbon of edible ash. Herbaceous & Tangy. Recommended Wines: Sancerre, Sauvignon Blanc, Pinot Noir, Dry Rose, White Burgundy, Super Tuscan, or a wheat beer. 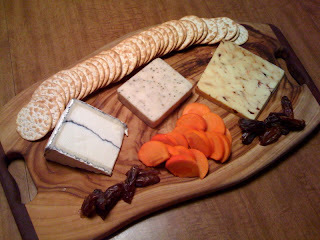 In the middle is a Goat Sage Cheddar from Spring Hill Cheese Co. in Petaluma, CA. The distinctive goat's milk tanginess melds beautifully with the sage, creating a zesty and robust kick... what an earthy delight! 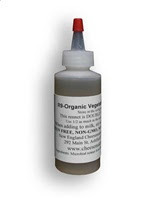 Venissimo's notes: Organic, pasture-fed, infused with sage, herbaceous and fresh, perfect on pizza. Recommended Wines: Chardonnay, Champagne. Finally we have the real zinger, the Chipotle Cranberry Cheddar from Carr Valley Cheese in Wisconsin. This white cheddar has huge smokiness and tang, followed by the slightly tart and sweet cranberries, ending with quite a bit of heat. Venissimo's notes: Studded with cranberries, infused with chipotle, sweet, BBQ sauce flavor, incredible melted! Recommended Wine: Zinfandel. Served with Fuyu Persimmon, Medjool Dates, and water crackers, this sampler was the perfect year-end treat. Thanks, Sean and Michelle! You're the best.